In April of 1953, history was made when Watson and Crick published their paper describing the structure of DNA—the culmination of years of effort from multiple researchers. In celebration of the event that forever altered the course of genetic science, we spent the month of April helping people of all ages engage with DNA and learn more about it. 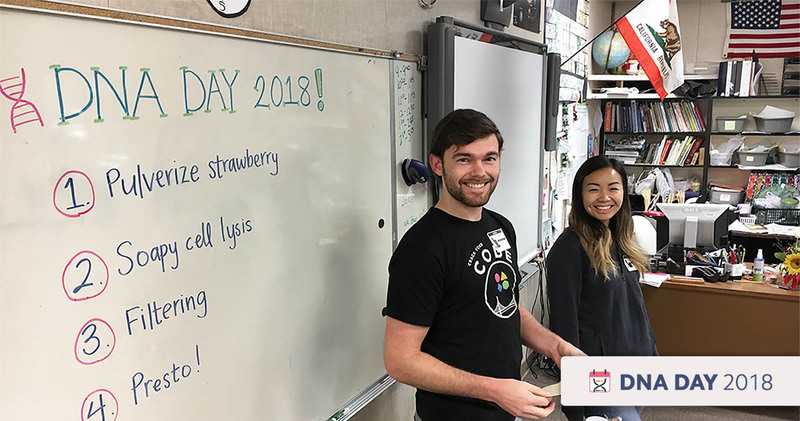 Many of us here at Helix became interested in science at an early age through hands-on demonstrations and fun (often messy) experiments, so we were excited to connect with local schools near our facilities in San Diego and the Bay Area to help students feel the same way! Here’s a video showing you how to do the same demo that we did—feel free to follow along at home—or for teachers, in the classroom. We also made a word search, coloring sheet, and instruction sheet to go along with it. For this demonstration, we elected to use strawberries for a few reasons: they’re easy to find, easy to mash up, and—most importantly—they have a lot of DNA. Human cells have two copies of their DNA; strawberry cells, on the other hand, have eight! This makes it easier for us to extract enough DNA to be able to see it with the naked eye at the end. Tip: We suggest getting strong bags or encouraging kids not to smash the strawberries on a table because the bag might rip. Having pulverized the strawberries, we then had a goopy collection of cells. Next, we needed to get to the DNA that’s locked away inside those cells. To accomplish this, we used a lysis solution. Lysis is just the scientific term for breaking open a cell, so by using the lysis solution, we were able to break open the cells and gain access to the DNA (and separate it from other parts of the cell). Lysis buffer is made up of three components: water, salt, and soap. Preparing lysis solution in the classroom! The soap is the active ingredient that will break open the strawberry cells. It does this because soap has the ability to grab onto a class of molecules called lipids (which cell membranes are made out of) and dissolve them in water. Conceptually, it helps to think of cells as a bag with DNA (among other things) inside. The bag, or cell membrane, is made out of lipids. The soap binds to and breaks up this membrane, and carries it off into the watery solution—dissolving the cell membrane. The ingredient in soap that does this can be found in most household soaps (dish soap, hand soap, and even shampoo). The salt is what will help us condense the DNA and see it with the naked eye. DNA naturally dissolves in water because water molecules (H2O) are able to chemically interact with much of the DNA structure. If we want to see the DNA, we’ll have to reduce these interactions so the DNA collects together rather than spreading out into the water. This is where the salt comes in: sodium ions in the salt molecules (NaCl) can also interact with the DNA, and will decrease the amount of connections between the DNA and water. To make the lysis solution, we mixed one teaspoon of salt into about a half cup of water and mixed it well until the salt was fully dissolved. Then we added in two tablespoons of dish soap and mixed again. Once the solution was made, we poured about 3 tablespoons of it into the strawberry goop bag and proceeded to massage the bag a little bit more. Tip: We provide exact numbers here for reference. In reality, it’s ok to add a little more solution if needed. Just know that the more you add, the longer you’ll have to wait in the next step. At this point, we had a solution with DNA floating free from the confines of a cell, but there’s also a lot of other strawberry cell debris that we needed to filter out, since the goal is to have just DNA at the end. So we removed all of the extra stuff using a coffee filter. The DNA is dissolved in the solution and it will just flow through the filter with the liquid, but larger debris won’t. After filtering, we had a debris-free liquid that looked like watered-down strawberry juice. This step took a little while, and the kids found out that wet coffee filters break easily. That’s okay, though—we had extra filters and everyone got there eventually. Be warned, this step often involved getting soapy strawberry mash on your hands. If dish soap irritates your skin, you might want to wear gloves, otherwise just make sure you rinse your hands off at the end (they’ll already be soaped up). Tip: It’s okay for there to be some debris in the cup afterwards, you’ll still be able to get the DNA. Just try to keep the debris to a minimum. Also, you don’t need very much solution at all—some kids barely had enough to cover the bottom of the cup but still got a fair amount of DNA. All that was left was to condense the DNA and pull it out of the solution. To do this, we used 91% rubbing alcohol (isopropyl alcohol). Alcohol can’t make as many chemical connections with the DNA as water. The link between water and the DNA has already been weakened by the salt we added, so the alcohol finishes the job. This is why we used alcohol that was at or above 90%—if there’s too much water in your alcohol, it won’t be able to work as effectively. We added an equal amount of rubbing alcohol to the strawberry juice concoction and stirred it around with a toothpick. Voilà! The white fluffy material that appears is the DNA (and salt). Using the toothpick, we scooped the DNA out of the solution and got an audible gasp from our young audience. When they managed to get DNA on their own, they were ecstatic. As you can probably tell, we all had fun with this one. After letting the kids play with the DNA a bit, we answered questions. Yes, you could do this with many other kinds of fruits and food. No, none of us play Fortnite. Yes, the X-Men universe partially relies on DNA to explain their powers, but it’s a bit more complicated than that. We loved hearing these questions, and we’re always happy to answer more—just connect with us at @my_helix on Twitter!